I would just like to thank you for our amazing wedding photos. I cant stop looking at them since I got them, they are all amazing, every single one of them. It was a pleasure to work with you and I didn’t even know you where there. Everything we asked off you was no problem and we did not have to worry about a thing once you where there with us. You where so much more that just an amazing photographer but also our eyes, and our watch which was brilliant. You captured so much of our day that we missed and we smile from ear to ear each time we look at every single picture of our day. My only complaint is that I cannot choose my favorite as I love them all. You made us feel at ease all day and most of that time we didn’t even know you where there, I got the shock of my life when you came to say goodbye as I though you had gone hours ago but seeing the photos we can see you didn’t have a second to yourself you captured every second of our day, and it is just brilliant to see it from every angle. Caolan and I received the disc on the 28th of Sept with our wedding pictures and we are absolutely thrilled with the results! I cant believe how many fantastic shots we ended up with, we are truly over the moon with your work. Coming down from Belfast to get married in Mayo meant a lot of research in finding a professional to work with and as we said before once we had seen your website we were positive we wanted you because of the amazing pictures and your reportage style approach to documenting the day as it unfolded without all that cringey posing others seem to insist upon! I’m so proud showing off my photographs to all our friends and family and I will treasure them forever.You were so easy and professional to work with in your constant communications and flexible friendly approach, we would highly recommend you to anyone wishing to secure amazing pictures for their big day that they will treasure always. Ciaran is an amazingly talented photographer. His style is very unique and he takes beautiful photos. He put us at total ease on our big day and this showed in every photo. His pictures tell a real story of the day and many of our guests complimented his lovely relaxed manner and style. People have since come to me looking for his details as they have been so wowed by the photos they have seen so far. We cannot recommend Ciaran enough. Thanks to Ciaran, we will have beautiful photos of our amazing wedding day to cherish always. We had looked at some of Ciaran’s work and really liked the slightly different edge Ciaran gave to his photographs whilst still having the great nack of keeping them professional and capturing all the essences of the wedding day. From the outset Ciaran arrived at the Bride’s location on the morning of the wedding on time – got some fab shots of family friends and bridesmaids preparing to leave the house – wonderful pictures/moments many photographers miss eg. Mother with tear in her eye saying a few words to bride before leaving the house. Then throughout the day Ciaran was obliging to any of our requests but we let him pretty much give us the ideas. Again amazing shots in the church and then at the reception capturing key moments but those funny moments many others would miss. As for the quality of pictures go we were thrilled with the outcome of our lovely wedding album and Ciaran’s great ability to capture scenery, mood and activites of the day meant we now have AMAZING photographs/memories to treasure forever. We searched online for various photographers and Ciaran’s photos were unique and modern! Just really really liked the style in which the photos were done. Ciaran turned up on the day, relaxed and positive! He stayed that way throughout! He was fantastic to have at our wedding and we are delighted with the photos! He is unique in his style but traditional in his quality and standards. We opted for photos on a disc, they arrived in good time in a lovely case. The photos told a story of our day and allowed us to revisit the special moments that we shared with each other, family and friends! Couldn’t recommend him enough! Thank you! Ciaran is just brilliant, very easy to get along with. The photos were just fab. Turned up on time and got on with the job. It was all done in a very relaxed manner yet he had everyone looking perfect in the photos. Really delighted. Great job. Ciaran was great. He did all the necessary posed shots with the family etc… but also did lots of pictures that we didn’t know were going on. He was so great in the house in the morning before we headed to the church. We didn’t even know there was a photographer in the house which was great because everyone was a little emotional / stressed! Ciaran’s photos are a little different and quirky. I don’t really like getting my picture taken and I didn’t want to do loads and loads of posed shots. I liked the shots that Ciaran gets when no one is looking. Ciaran is such a talented photographic artist. From our first meeting with him he seemed very unpretentious and we were confident we had found a photographer we could rely on and who we could trust to capture all our wedding day memories! His unobtrusive, photo journalistic style of photography allowed us to enjoy our day even more; we barely noticed him there! If I could bottle him up and carry him around in my pocket to document all the events in my life with photos I would!! We cannot thank you enough for our beautiful wedding photos. Despite the weather not co-operating with us that day the photos with the umbrella and the grunge style pics you took are just gorgeous and among our favorites. We really appreciate the hours and hard work. Somehow you were everywhere that day and we didn’t notice = testimonial to your professionalism. We have received so many compliments. Ciaran, we just want to say a huge thank you for our wonderful wedding photographs! We both knew your style of photography was what we wanted for our wedding day, relaxed and natural. But we were still blown away by how fantastic the pictures turned out! It was so great to have such a laid back (and practically invisible!) photographer there on the day, we were totally at ease all day with you and really appreciate all your creative input as to what would work best. A huge thank you also for the album, we are delighted we spent the extra money getting it as it really is worth it. Everyone we’ve shown it to has said they’ve never seen anything like it, it’s stunning and something we’ll have forever! Thanks for everything, including all your help and advice from the moment we met you. We’ll be recommending you to everyone! On meeting with Ciaran he was very laid back and listened to what we wanted from our photographs. He arranged to view the venues beforehand, partly so he didn’t get lost on the day but also to get any ideas for good photo opportunities. On the day, we hardly knew he was there, and didn’t intrude on any part of the day. We didn’t feel like we were constantly having to pose for photos, and the natural ones are some of the best. We had a great experience with abaca photography and fantastic photos to cherish. From our first visit to Abaca studios in Westport, to our wedding day Ciaran was a true professional. The style of shots taken are second to none and give another dimension to wedding photography. Will be recommending Abaca to everyone we know. The reason why we choose Ciaran to cover our wedding was because the photo gallery on his website showed a certain artistic form of photography, which was different from the more standard and formal photos on other sites.Thank you so much for creating such fabulous and lasting memories of our wedding day. We found you so easy to deal with from the very first meeting, and you made us feel very comfortable on our big day. We were looking for something a little different from the traditional approach and you delivered far beyond our expectations. Our album is amazing! We love the layout and design, and it reflects a beautiful style of photography. Very competitive price, very relaxed photographer who made us feel at ease throughout the day. Very accommodating and a wide variety of photos taken. We were so lucky and happy to have chosen abaca photography to cover our wedding. From the beginning Ciaran understood what we were looking for, a relaxed yet professional approach and we received that and more. On the day there was absolutely no intrusion which created a calm atmosphere. The photos and album were superb and told the story of the day in a unique and beautiful way. Many family and friends have commented that it is one of the best wedding photo albums they have ever seen. 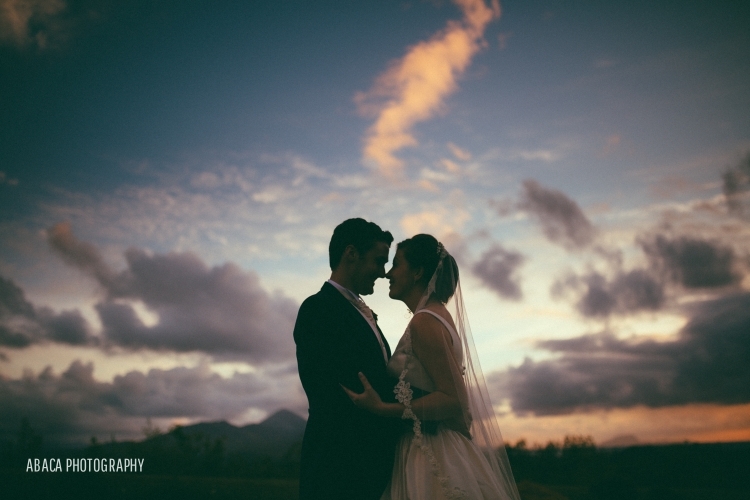 Ciaran, once again thank you so much for the fantastic photos and the wonderful service you provided. We will definitely be highly recommending you in the future.